Add vegetables and continue to cook for 6 to 8 minutes, or until tender.In a mixing bowl, combine peanut butter, soy sauce, sriracha, ground ginger, lime juice, and olive oil; mix until thoroughly combined. Add a tablespoon or two of water just to slightly thin it out.If there's water on the bottom of the wok, drain the veggies and place them back in the wok over medium-high heat. 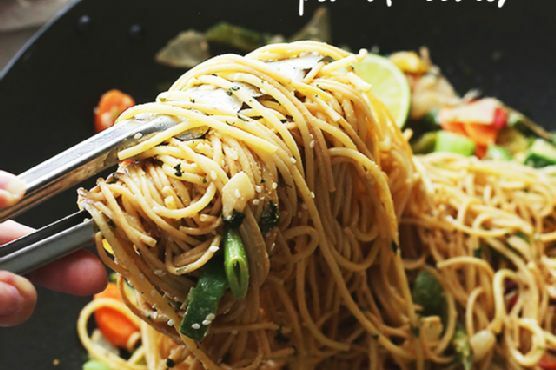 Drain spaghetti and add them to the vegetables.Gently stir in the peanut sauce, tossing to combine. Remove from heat.Sprinkle with green onions, cilantro, peanuts and toasted sesame seeds.